A gun owners necessity - This compact set includes everything you need to disassemble and work on most modern firearms. 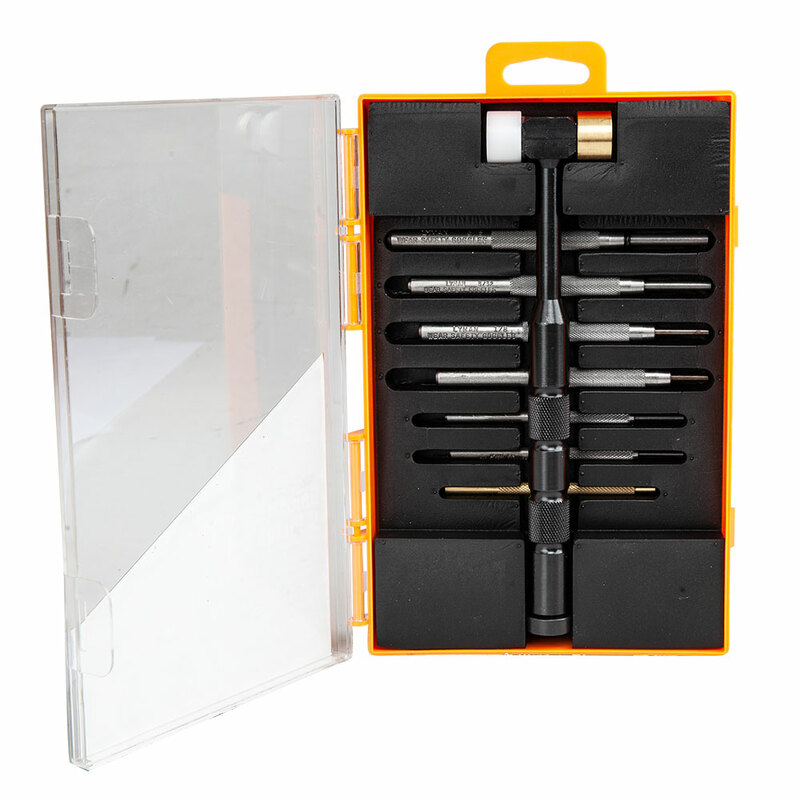 This compact set includes everything you need to disassemble and work on most modern firearms. It includes an 8" (20cm) hammer that has three different heads: brass, nylon and steel. This allows you to work on your guns without marring the finish. Comes in a neat wooden storage case. This is the same tool kit used in our Complete Glock DVD, and a favorite amongst our armorers in the GlockStore Custom Shop. Exactly what I was looking for except the quality control for the hammer was a little disappointing. First, I love the GlockStore for everything I need, but China snuck this one through on the quality control. When trying to switch out the various nylon/brass/steel screw-on heads for the hammer, I had to use pliers & a vise the remove the various heads. The male threads (5/16 x 18) on the steel and brass heads had not been died correctly causing a "cross-threading" inside the female threads. I had to use a tap/die to re-cut & clean out the filings and thicker threads. Again, I will continue to purchase all my Glock needs from them, but it was simpler for me to do a quick fix than the hassle of a return. Thanks for listening. I was a little disappointed when I realized there was no cover for the punch block. A hammer and punch set of this quality should have a cover to keep the trash out. I'm deducting one star. I will continue to do business with the Glock Store. They sell good products. I have owned this kit for about 8 years and will tell you it has the best hammer you can get. I have worn out one nylon head and bought spares. When I got mine people complained about the heads being loose and mine was a little but nothing to bad. It's beat all kinds of fire arms together and apart. I have bought three other hammers to try and find its replacement as #1 and all are no competition. Long review of a hammer I know, but if you tinker or work on small mechanical things you will enjoy the use of this tool. Oh the punches are ok and were added to the punch drawer. Two complaints is the punch tools handles are a little rough for my skin and I wish the tools had retention to take out. Other than that it is amazing! The tools work great, but it comes in a cardboard box with the front uncovered. Once you take off the plastic wrap from the tools, you are without any sort of sleeve to put the tools in (there is nothing keeping the tools in the wood). Otherwise, great product. Was very pleased with the quality of this set. If you do any work on firearms, this is the punch set for you. It comes in a very nice wooden holder for the hammer and punches. Some folks have complained that the wooden holder is not actually a case (it does not have a lid). Not a problem as far as I am concerned. It fits nicely in my tool chest and keeps everything neat and orderly. You won't be disappointed with this set. Perfect for working on your Glock or any pistol. Priced right also!